Alexander von Mühlendahl is an attorney at law who provides advice on – and handles litigation involving – German, European and international trademark, design and unfair competition law. In 2005 Professor von Mühlendahl joined BARDEHLE PAGENBERG Partnerschaft mbB, bringing with him more than four decades of professional experience gained in leading positions in German and European trademark legislation, practice and academia. For 11 years (1994 to 2005) he was vice president of the Office for Harmonisation in the Internal Market (trademarks and designs) in Alicante, Spain (now the EU Intellectual Property Office). Before that, from 1985 until 1994, he was head of the division for trademark and unfair competition law at the German Ministry of Justice. Among the legislation for which he was responsible in this role were amendments to the Unfair Competition Act, the IP legislation following the unification of Germany in 1990 and the new Trademark Act 1995. Throughout this period, Professor von Mühlendahl represented the German government in negotiations in Brussels on European trademark law and in World Intellectual Property Organisation matters. Professor von Mühlendahl advises and represents small, medium-sized and large producers of trademarked goods from various European countries, including in proceedings before the EU General Court and the European Court of Justice. 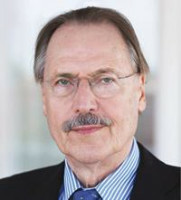 Professor von Mühlendahl is one of the original inductees of the IP Hall of Fame (2006). He is also an honorary member of the European Communities Trademark Association, the French Association of Trademark and Design Law Practitioners and the Hungarian Trademark Association. Professor von Mühlendahl is a visiting professor at the Centre for Commercial Law Studies at Queen Mary, University of London; he also teaches at the University of Strasbourg, the University of Alicante (Magister Lucentinus) and the University of Hagen.